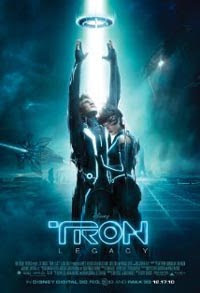 Tron: Legacy (2010) is a sci-fi movie, a sequel to the 1982 Tron. Synopsis: It has been 20 years since the mysterious disappearance of Kevin Flynn (Jeff Bridges) who had once been the world's leading video-game developer with ENCOM International. He leaves behind a young son named Sam (Garrett Hedlund). One night, Alan Bradley (Bruce Boxleitner), Flynn's old friend visits Sam and tells him about a mysterious message on his pager that comes from Flynn's old arcade. While searching for clues, Sam is pulled into the digital world of The Grid where his father is trapped for the past 20 years. Aided by Quorra (Olivia Wilde), Flynn's loyal and fearless confidante, the trio embark on a life-and-death journey inside the visually stunning cyber universe where they encounter dangerous vehicles, weapons, and landscapes. However, their worst enemy is CLU (Jeff Bridges), Flynn's original program that will stop at nothing from carrying out his sinister plan. What's my greatest impression after watching this movie? I see a really stunning digital universe with stylishly futuristic vehicles - Lightcycles, Light Runners, Solar Sailers, Recognizers, and Light Jets - all made for thrilling race-and-chase action sequences. The disc fighting choreography is gracefully and beautiful executed. Awesome! Another eye-catching element in this movie is the costumes. The actors and actresses are donning sleek, skintight, black costumes with florescent neon blue or brilliant orange lines. Some are dressed in pure striking white costumes. The brilliant fusion of electronic and orchestral music by Daft Punk is worth a mention too. Note: Thanks Yes World for the tickets.